The GHMC sweeper, Ankuri Giri, 34, who was arrested on charges of the double murder, had committed the murder with the motive of robbing the gold ornaments worn by the women. Hyderabad: It was the urge to learn black magic that led to a brutal death for two women, both vegetable vendors in Meerpet, whose bodies were found on the Musi riverbed in Langar Houz on January 22. According to City Police Commissioner Anjani Kumar, a GHMC sweeper, Ankuri Giri, 34, who was arrested on charges of the double murder, had committed the murder with the motive of robbing the gold ornaments worn by the women. The police recovered a pair of gold earrings and one mobile phone from Giri. 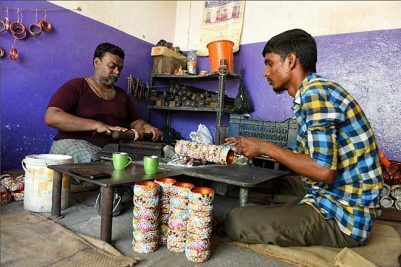 Announcing the arrest of Giri, a resident of Petlaburj, Charminar, here on Tuesday, Anjani Kumar, said the two women – Yadamma (50) and Sumithra (45) were lured to the place by the suspect who offered to teach them black magic. On January 21, Giri, who was working as a GHMC sweeper at Chandrayangutta, met the two women at a toddy compound at Dattunagar in Kanchanbagh. “During their conversation, he told that he knew how to perform special poojas and that he could train them in it. Believing him, the women went along with him to the Musi riverbed in Langar Houz. The man, along with the two women, consumed toddy they had brought with them. A little later, he attacked them with a stone resulting in their death. He then took away their gold earrings and dumped the bodies in the river and left the place,” the Commissioner said. With the assistance of the Langar Houz police, the Commissioner’s Task Force (West) nabbed Giri.